A special edition of the ‘Advertiser’ on Wednesday, August 5th , announced that war had been declared. The news came through by special wire and too late for the London and big provincial dailies, the ‘Advertiser’ was the first locally to announce it. The issue of mobilisation papers the previous day had created a stir in the town. Official proclamations were put up at the Police Office, Beaumond Cross and on the churches. When the evening newspapers arrived, the boys were besieged. There were wild rumours respecting fantastic naval engagements, and the boom of guns along the coast was reported from different towns. The Militia were called out and assembled at the barracks on the afternoon of August 5th and the Chief Constable (Mr. A. Wright) as billet master, took possession of the schools of the town for their reception. On Monday, August 3rd, the 8th Battalion Sherwood Foresters, were in camp at Humanby, near Filey, when notice was received to strike camp and return to headquarters at Newark. The Mayor (Coun. J.C. Kew) and the Chief Constable were notified by wire to meet Captains Appleby and Ashwell, to arrange billeting the Battalion of 850 men and 30 officers at Newark for the night. When this had been arranged, fresh orders cancelled it, except for the Newark Company, 100 strong, who were marched to the Drill Hall. It was estimated that over 100 reservists in Newark had been notified to join the Colours at their depots. They went gladly, rejoining their old regiments to do their “bit”. The threatened outbreak of war had induced the Mayor to call a special meeting of the Council on August 4th, to consider the effect of war on the foodstuffs in the town and take steps to for the protection of the poor. It was not certain whether the works could be kept going, or whether the food stocks of the country would be quickly exhausted. There was every prospect that famine prices would quickly obtain. He deprecated the hoarding of foodstuffs, there being at that time a scramble for flour. A leading miller had told him that there was only enough in stock for 10 or 14 days at the outside. He thought they should get an option on the foodstuffs available, make prompt purchases at the present prices, store the food and release it when other sources had dried up. An appeal was made to the people not to attempt large purchases. Subsequently, an order for 1,000 bags of flour was given by the Corporation and 500 bags were actually put in store at the Trent Navigation Warehouse. After the first few weeks, when it was known that the British Fleet held the seas, the position to some extent eased and it was not necessary to distribute the stock of flour, which was eventually released. The Vicar (Canon Hindley) opened the church for daily intercession and extended references were made in all pulpits to the crisis. Some of the works re-opened after the holidays, while others delayed opening for a week. The Royal Proclamation of that week authorized the requisition of any British ships, or ships within British ports, for use as transports and auxiliaries. Extended the service of time-expired men of the Royal Navy and called out all officers of the Royal Naval Reserves. Postponed the appointment of certain Bills of Exchange, appointed August 4th, 5th & 6th as Bank Holidays and prohibited the exportation of certain war-like stores, such as aeroplanes, arms etc. Newark Red Cross ladies went into daily training for nursing duties. The town quickly became the centre of martial activities, the streets resounded to the tread of mounted troops and infantry. Uniforms and accoutrements were issued at the Barracks on Thursday, August 8th, the Militia, 1,000 strong, were entrained for the North, thoroughly equipped. There was much enthusiasm and they were given a great send-off. The most spectacular day of the first week was Friday, August 9th, when the 8th Battalion were embodied under the command of Colonel C.J. Huskinson and Adjutant Captain Collin. 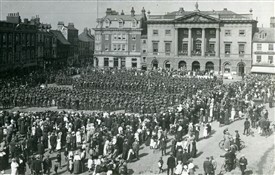 A Company (Retford) arrived with the band (under Bandmaster Dromey) and on arrival at Newark Market Place, Major Fowler read the Battalion orders. Later they were marched to billets at Lovers Lane School and that sort of procedure was undertaken with regard to the other companies, who were billeted as follows: C (Sutton-in-Ashfield) and D (Mansfield): Magnus Grammar School, E (Carlton) in the Town Hall, F (Arnold): Northgate House, G (Worksop): Lovers Lane and H (Southwell): Old Magnus buildings. Rations were delivered to the various billets and the men well fed. The local officers included Colonel Huskinson, C.O., Major G.H. Fowler, Adjutant-Captain E.T.N. Collin, Surgeon-Captain H. Stallard, Reverend J.P. Hales (Chaplain), Captain L.C.B. Appleby, Lieutenant C. Davenport and Lieutenant A.H. Quibell with the following from Southwell: Captain J.P. Becher, Lieutenant J.K. Lane, Lieutenant T.B.S. Handford. Each man was entitled to 5 Pound bounty and received an identity disc. Colonel G.S. Fojambe was appointed in command of the depot, Lieut. Davenport: Regimental Transport Officer, Lieut. Handford: Regimental Signalling Officer and Captain Hodgkinson, of the reserve of Officers, Billeting Officer. A good deal of interest was taken in the military proceedings of requisitioning horses and many Newark traders had to give up, at un-remunerative rates, horses and carts and other impedimenta. Newark’s Squadron of the Sherwood Rangers Yeomanry reported at the Drill Hall on the 5th August and the shortage of horses caused some difficulty. Issue of accoutrements, saddles etc. proceeded expeditiously and the Squadron was preparing to move to the headquarters at Retford. The progress of the war and its repercussions in differnt parts of the world, was read with feverish interest by the people and newspapers were quickly absorbed. The defence of Liege caused great admiration. On Monday, August 10th, an official ‘Good-bye’ was said to the Newark Troop of Yeomanry, under Major Harold Thorpe. The men paraded at the Horse Repository, Newark Cattle Market ground and at 6.40 a.m. the Mayor (Mr. J.C. Kew) with members of the Corporation, met at the Town Hall and headed by the Newark Borough Band, under Mr. F. Carle, proceeded in state to give an official send-off. The Mayor addressed the troops, reminding them that they met under the walls of the old castle, eloquent of the unconquerable spirit of their forefathers, and in the course of his remarks said that in the Napoleonic wars, their commanding officer had received the thanks of his Majesty in 1805 for their public service. The homour of their regiment, was in their hands. It might be also the safety of their hearths and homes, and they would look to Newark soldiers to protect them. And they would not be disappointed. Prayers were said by the Vicar, and Major Thorpe thanked the Mayor ant the people of Newark for their kindness. Later in the same day, the Market Place was packed with an enormous crowd to participate in one of the most historic episodes in the annals of Newark. It was none other than the sending forth of the 8th Battalion Territorials to the war, with the benedictions of the whole populace. The Mayor, the Mace-bearers and Corporation were accommodated on a platform fronting the Town Hall, accompanied by the three Vicars: Canon W.P. Hindley, Rev. W.J. Betson and Rev. W.B. Sealy and supported by the members of the three choirs and St. Augustine’s in cassocks and surplices. The Mayor again delivered a stirring address and bade them go forth baptised with the spirit of their ancestors, who were renowned for their intrepidity, valour and courage, always maintained in the cause of God, King and country. Colonel Huskinson responded and the troops, over 1,000 strong, marched out of the Market Place, en route for Radcliffe, the first stage of their journey. On the previous Sunday a striking drum-head service of the 8th Battalion was held in the Market Place, conducted by the Vicar of Newark (Canon Hinley) and was of a moving and impressive character. On the evening of this momentous day (Monday, August 10th, 1914) the Mayoress (Mrs. J.C. Kew) presided over a big meeting in the council chambers of the town hall, which was packed to its utmost capacity. Then was launched the Mayoress’s Ladies Working Party, which promptly commenced the work of providing comforts for the troops, for hospitals and convalescent homes. The Mayoress on that occasion said she was sure the women of Newark were most anxious to do what they could for their country. She had thought of several ways and decided the most useful would be to get together for sewing and knitting for the production of bandages and garments for the sick and wounded, and socks, handkerchiefs, and comforts for the men serving. She had the offer of 18 fully equipped beds and the use of a motor-ambulance, and of the town hall as a temporary hospital if required and considered suitable. It was decided to start as a working party at once and regular meetings, right through the war were held, under the leadership, first of Mrs Kew, subsequently Mrs W.E. Knight and then the later Mayoress (Miss E. Knight). The first touch of martial law in Newark was the promulgation by Colonel Reek, Commandant of the Military Authority, of an order closing the public-houses, except during the hours of 12 and 1 noon, and 6 to 9 p.m. The Tradesmen’s Association gave their first whist drive to the Mayoress’s Working Party Fund on Thursday, 8th January 1915. The Mayor nominated a committee for preparing to meet any distress arising from unemployment and scarcity at home, and for watching the interests of the wives and dependents of sailors and soldiers engaged on active service. He had been requested by the Prince of Wales to appeal for subscriptions to the National Relief Fund. It was intended that it should be worked in co-operation with the Soldiers’ and Sailors’ Families’ Association, with the Patriotic Fund and Queen Alexandra’s Fund. The Mayor worked hard for the fund in Newark, which realized the noble sum of 2,250 Pounds. The Soldiers’ and Sailors’ Families’ Association was later officially appointed to take over the work of looking after the dependents in Newark and was in 1919 taken over by the Local War Pensions Committee. On Thursday, August 13th, the Mayor (Mr. J.C. Kew) called a town meeting to promote recruiting and consider the formation of a civic guard. There was a large attendance and much enthusiasm was shown. It was felt that vulnerable points, such as the Tubular Bridge, Waterworks and other places should be provided with a Military Guard. The meeting was very enthusiastic and Alderman W.E. Knight, who said he was 70 years of age, with a 35 spirit, proposed the formation of a committee, to form a civil guard. Many names of recruits were handed in. The War Office some weeks later deprecated the formation of town guards as they might draw in young men who ought to volunteer for service. A meeting was convened at Newark and a resolution submitted by the Mayor, was carried that instead of forming a civic guard, a rifle corps be organized in its place. This was the beginning of the Volunteer movement in Newark. Eventually the “O” Company of the 12th Volunteer Battalion of the Sherwood Foresters, with sections at Southwell and Collingham was formed. Uniforms, arms and equipment were eventually supplied by the Government and camps were held at Clipstone and Skegness. Captain Ringose was the first O.C., followed by Captain Need. Local firms were feeling the effects of the stringency in the money market, and the unsettled outlook. People were not buying clothes and expenditure was cut down. Messrs. Mumby were working 40 hours instead of 54, Bradleys 38 hours, Ransome and Coy. were getting anxious, and Abbotts were working normally. Seventy-five men at Simpson’s had left and no more were taken on. Nicholson and Sons were running four days per week. The Labour Exchange said Newark compared very favourably with other towns, and there was not that unemployment yet noticeable. The immense demand for ball bearings manufactured at Stanley Works necessitated a rapid additional space, and new shops were erected in order to double the output. As more men were called to the war, women were enlisted, and this firm, with others in the town were kept working night and day turning out munitions of war, so that early forebodings of slackness and unemployment were unfulfilled. The munitions foundries and clothing factories kept everyone exceedingly busy. At the request of the Government, the Mayor was asked to provide hospitality for Belgian refugees, and preparations were put in hand. On October 14th the first contingent arrived and were housed in Crown Street, in a house lent by Mr. J.J. Eyre and furnished with voluntary gifts. The Mayoress’s Belgian Home Committee did much towards making the refugees happy and comfortable in Newark. The ladies were assisted by many others, including Miss McKenzie, who started classes in English. The work was very successful and other homes were started in the town and country villages, and over one hundred were maintained for several years, until they were in turn made self-supporting. On September 2nd the first swearing in of Special Constables took place. The Mayor (Mr. J.C. Kew) and Major Milthorp administered the oath. The former addressed the men and congratulated them upon having volunteered for this work, and in sacrificing their leisure. In these times they relied upon one another for the good government and well being of their old and historic town. They were face to face with a great crisis and it was well they should have a body of men upon whom they could rely. A list of 110 of the names was published in Advertiser of September 9th, 1914. It was stated that when called out for service, would be supplied with a special blue-and-white silk webbing armband. reception, housing and feeding of the fleeing population; Mr. G.A. Lacy, in charge of removal of cattle, clearance or destruction of live stock; Mr. T. Bradley, Newark Navigation and the Trent. Commanding at York, and their military assistants, and certain officers of the Royal Engineers were detailed to attend the committees, and to advise on the organization. It was in the military scheme that Newark should become an important point in the defence of the country, and that all refugees fleeing from the coast via Lincoln and Newark should be kept clear of the town, and their reception and feeding provided for. Weekly meetings of the committee were held at the Town Hall, which was their headquarters and there were attached the Red Cross departments, and arrangements for succouring the injured. All the leaders were sworn in as special constables and working parties were divided into groups, and a big organization was perfected, but happily it was never necessary to put it into operation. Eventually, under instructions from the Home Office this committee took over the special patrol for air raids, and this continued until the close of hostilities. A siren warning of aircraft approaching was adopted, the specials were’called-out’ for their beats on the warning ‘take air-raid action’, being received. Every time the Zeppelin raiders crossed the East Coast, the men were called out, and they had some thrilling experiences. Bombs fell all round the town, and many raids were witnessed, yet Newark was never struck. During this period the town was darkened, and lighting, public and private, was stringently suppressed. Click HERE to go forward to PART 2 of 'Newark in the Great War'.